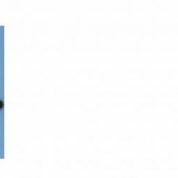 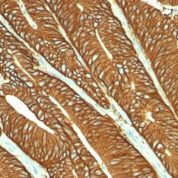 EGP40 is a 40-43kDa transmembrane epithelial glycoprotein, also identified as epithelial specific antigen (ESA), or epithelial cellular adhesion molecule (Epcam). 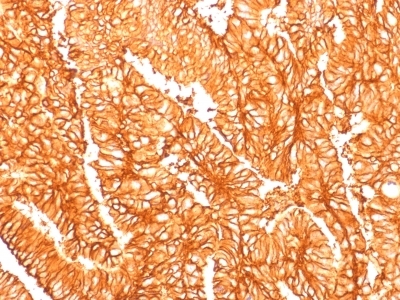 It is expressed on baso-lateral cell surface in most simple epithelia and a vast majority of carcinomas with the exception of adult squamous epithelium, hepatocytes and gastric epithelial cells. 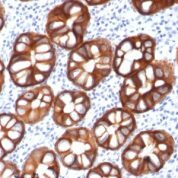 This antibody has been used to distinguish adenocarcinoma from pleural mesothelioma and hepatocellular carcinoma. 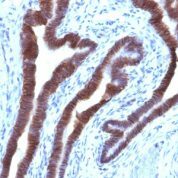 This antibody is also useful in distinguishing serous carcinomas of the ovary from mesothelioma.